In 1975, a notable Queensland property developer, Keith Williams, was enjoying a leisurely cruise aboard his yacht when he came across Hamilton Island, one of 74 islands of the Whitsundays he hadn't previously noticed. After making some enquiries, Williams purchased the island and tourism was born. The largest inhabited island of the Whitsundays, Hamilton Island is now owned by Bob Oatley AO, famed for his vineyards and his super-maxi yacht, Wild Oats XI. With direct flights from most major Australian cities, Hamilton Island is the gateway to the world heritage-listed Great Barrier Reef and the quintessential island escape, where the primary mode of transport is a buggy. To help plan your next holiday escape, here's our guide to the best of the slice of heaven that is Hamilton Island. Pristine beaches, delicious food and wine and active pursuits galore! Rain, hail or shine, a trip to Whitehaven Beach is a must. The seven-kilometre stretch is just a 40-minute cruise from Hamilton Island and frequently makes the lists of the best beaches in the world. The sand is almost pure silica, which gives it its intense white colour. The tidal currents constantly shift the sand, creating the exquisite white and turquoise swirl the beach has become synonymous for. Upon arrival, keep a sharp eye out for the enormous turtles which bob their heads in and out of the water by way of greeting the boat. Even if you've never picked up a golf club in your life, you'll find yourself wanting to pull on a polo and tee off at the Hamilton Island Golf Club, which actually isn't on Hamilton Island at all. The par 17, 18-hole course designed by five-time British Open winner Peter Thomson takes up an entire Whitsunday island, Dent Island, which is adjacent to Hamilton and a 15-minute ferry ride away. Be sure to make a day of it and stay for lunch. The Club House does a lunch special for $65 per person, which includes a two-course meal, a tour of the Island and return transfers to Hamilton Island. From kayaking to catamarans, Hamilton Island has just about every water sport covered. You'll find the Hamilton Island Beach Sports hut on Catseye Beach where all non-motorised equipment is available for hire or for free if you're staying at their preferred hotels. Water sports are weather and tide dependent, so check in with the guys in the hut for the latest report. The only time you're going to want to hop out of your buggy is to hit the walking tracks and make for the lookouts. The challenging hike up to Passage Peak is well worth breaking a sweat for. It's the highest vantage point on the island and offers more breathtaking pics than you're Insta-collage will be able to handle. A journey inland will take you over to the Resort Lookout for 360-degree views of Hamilton Island's spectacular surrounds. Bommie. 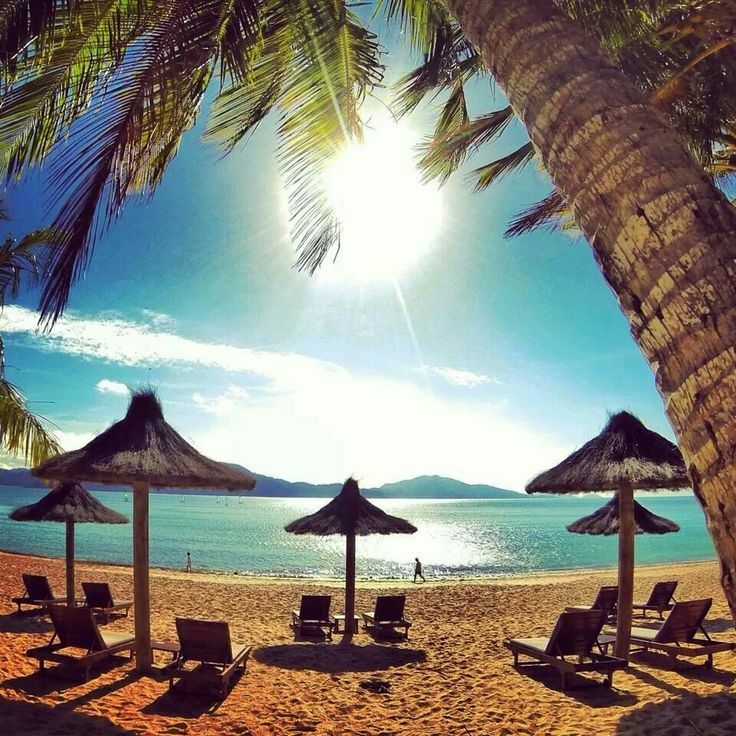 Image credit: @hamiltonisland Instagram. Bommie is Hamilton Island's answer to fine dining and is a past winner of the 'Best Tourism Restaurant in Queensland' at the Savour Australia Restaurant and Catering Awards. With its name an indigenous Australian reference to the water that breaks on the rocks beneath, Bommie is perched on the deck of the Hamilton Island Yacht Club overlooking the Coral Sea and neighbouring Dent Island. The minimalist Modern Australian menu is curated utilising fresh, local produce such as Black Kingfish and Reef Fish. Bookings are essential. Ask anyone who has been to Hamilton Island for a restaurant recommendation and they will send you to coca chu. Located right on the water at Catseye Beach, the South East Asian restaurant is headed up by Executive Chef, Adam Woodfield, who is a graduate of William Angliss Institute right here in Melbourne. Woodfield's career has seen him take to the kitchens of the iconic Stokehouse and The Willows in Melbourne, and abroad to the Michelin-starred Public in New York. But it is his frequent travel to Thailand, Vietnam, Cambodia and Laos that has inspired the menu at coco chu, which boasts punchy Asian flavours. The betel leaves with chicken, mint, lemongrass and roasted eschalot eggplant relish are to die for. Mariners Restaurant enjoys a prime position in the heart of town overlooking the marina. If you're a seafood nut then this is the place to be. And if you're the nuttiest of seafood nuts then the hot and cold seafood platter is your go-to dish. While a little on the exy side at $240 a pop, you'll be swimming in sea creatures; a crispy whole fish and chilli lime lobster are just the beginning, while French fries and a mixed leaf salad are thrown in for good measure. There are a couple of classics that make the menu too – a good old prawn cocktail and a mighty bombe Alaska for dessert. The steamed greens with smoked tomato and garlic crumbs are perfection. 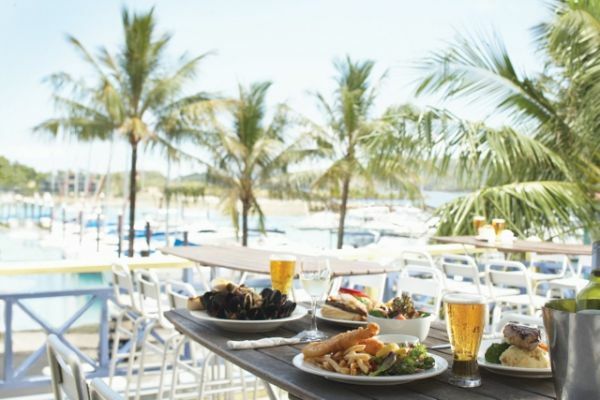 No holiday destination would be complete without a local Italian, which in the case of Hamilton Island is Romano's, located on the waterfront. With polished timber floors and a vast deck, Romano's offers an ambient setting and an exquisite menu. But be warned – the restaurant is closed on Thursdays and Fridays so make sure you plan ahead. A helpful hint – if you want to book any of the restaurants mentioned above, simply head to the reception desk at the Hamilton Island Yacht Club before 3pm and they'll take care of it for you. If your restaurant of choice isn't available, they'll make a call to your number two. 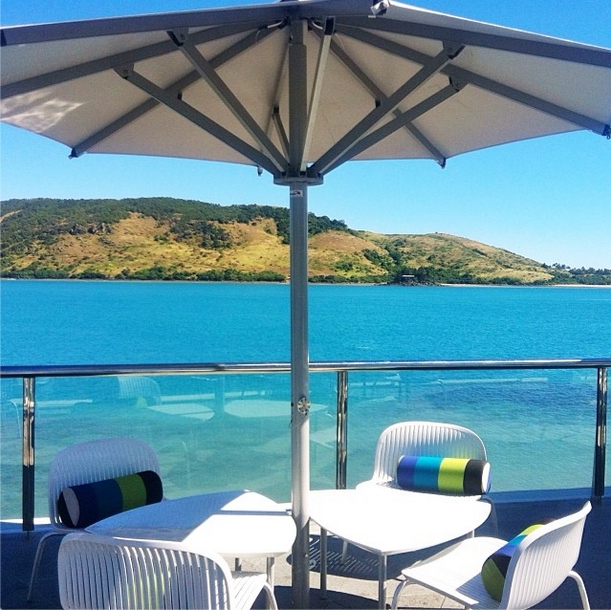 Manta Ray Cafe is the pick for casual dining on Hamilton Island, featuring a menu brimming with gourmet pizza and pasta. It's also not a bad spot for a cocktail. If you're sitting on the deck however, be warned; the cockatoos may be a novelty to begin with but they're not afraid to eat right off your plate. If you're far too relaxed to don your glad rags and venture out for lunch or dinner take advantage of the home delivery service. Note: Manta Ray Cafe will be closed until July. Marina Tavern. Image credit: Whitsundays Holidays. The Hamilton Island Yacht Club, designed by Sydney-based architect Walter Barda, is reminiscent of a giant stingray but was in fact inspired by the silhouettes of sails in full flight. Aesthetics aside, its expansive outdoor terrace, Bommie Deck, is ideal for an afternoon tipple and offers a tapas menu until 5pm. The one and only pub on the Island is the Marina Tavern. Luckily it's got all you could possibly want from your local – beers, parmas, pokies and a TAB. And not one, but two outdoor decks. Without wanting to sound sexist, ladies, it really is the perfect spot to leave your fella if you need a little 'me time'. One Tree Hill is not a bar. Nor is it a restaurant or club. Rather, it's the most picturesque lookout on the Island and the best spot to watch the sun go down on the Whitsundays. On some days, there's a mobile bar but best to BYO to avoid disappointment if you've failed to check the activity guide. If you're hoping for some romance with your loved one, just be aware that you will most likely be sharing your special moment with half the Island. It's well worth it though. There's no shortage of drinking holes at the Beach Club on Catseye Beach, but a holiday in the sun just wouldn't be the same without a drink at a swim-up bar now, would it? The Island Bar in the middle of the resort's lagoon-style pool offers just that, and if you're not ready to take the plunge, a little bridge will take you to the dry side. Windward Pavilion at Qualia. Image Credit: Qualia. 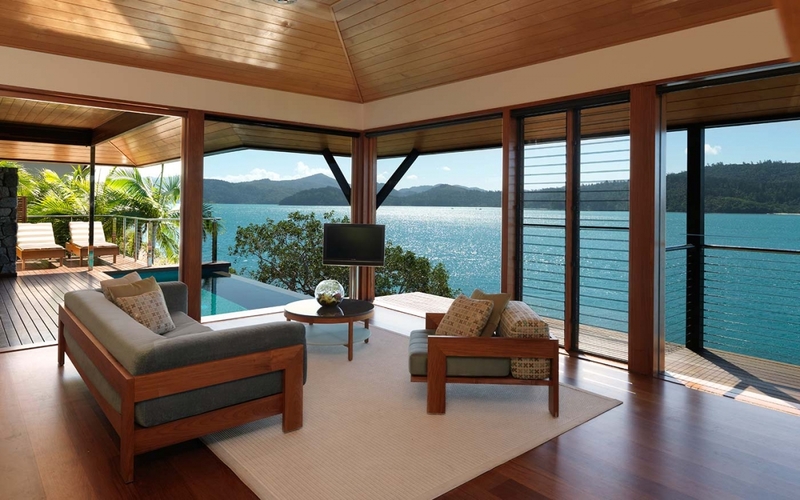 If you're not short of a penny, then qualia is the pick of accommodation on Hamilton Island. The luxury resort was voted Best Resort in the World in the 2012 Conde Nast Traveller Reader's Choice Awards and is one of only four Relais and Chateaux hotels in Australia. The Yacht Club Villas are perfect for families and large groups; enjoy the expert free service of the Island Concierge who will take care of just about everything for you. Over at Catseye Beach, the Beach Club offers boutique-style accommodation, or you can choose from one of many holiday homes dotted around the Island. For everything you need to know about Hamilton Island visit www.hamiltonisland.com.au. A born and bred Melburnian, Rebecca Elliott has a serious passion for her city. Combining this with her love of food and a fine drop of wine, on any given weekend, or anytime for that matter, Rebecca can be found sampling the fare at the latest dining hot spot and then sharing that experience with anyone who will listen.